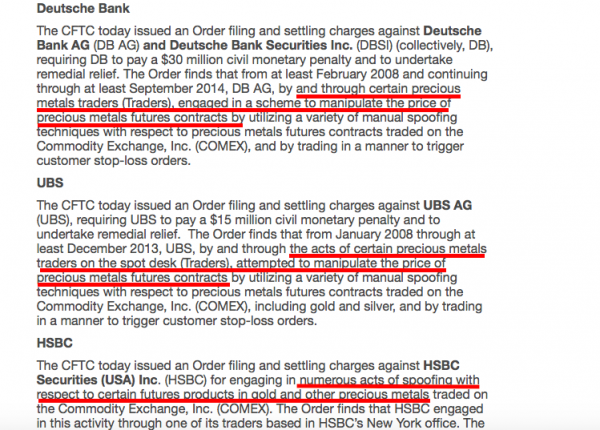 Deutsche Bank, UBS and HSBC had all been accused of engaging in manipulating the gold price and the bullion banks have now admitted they are guilty of the charges and have paid fines. All those named in the investigation have been found to be manipulating the gold and other precious metals markets. The banks face fines, although they can hardly be described as hefty given the size of their balance sheets and impact of their actions. Deutsche Bank and UBS have agreed to pay $30 million and $15 million respectively, while HSBC will pay $1.6 million. The fines have been reduced as each of the banks assisted the CFTC in investigations which go back to activities as far back as 2008 and admitted the charges. For years the idea that precious metals markets are subject to more than just free market forces has been dismissed by the mainstream media and some market commentators Many have referred to gold and silver manipulation and gold bullion price suppression as topic fodder for the conspiracy and deep web forums. This is despite many years and reams of much evidence to the contrary. Isn't this all illegal? Shouldn't someone go to jail? Yes, as part of the 2010 Dodd-Frank financial reform, spoofing is a criminal offence. What is spoofing? As explained above, the fines for UBS and Deutsche Bank are north of ten million, while the fine for HSBC is slightly less at £1.6 million. Surely traders and other connected employees should be facing prison? Last August, a U.S. appeals court upheld the conviction of former New Jersey-based high-speed trader Michael Coscia who was the first individual to be criminally prosecuted for spoofing in the US, aside from Sarao of course. Does this mean that manipulation is coming to an end? Possibly but it is unlikely to, at least until monetary authorities including China's PBOC wish it to. Or indeed, the media give Gold Anti-Trust Action Committee's (GATA) allegations a fair hearing and report on the matter in a balanced manner and thereby put pressure on monetary authorities to desist from rigging precious metal prices through bullion bank proxies or indeed official partners such as the New York Federal Reserve. The price is being suppressed until China gets the gold that they need. Once China gets the right amount of gold, then the cap on gold’s price can come off. At that point, it doesn’t matter where gold goes because all the major countries will be in the same boat. As of right now, however, they’re not, so China has time to catch-up. Manipulation isn't unique to precious metals markets. 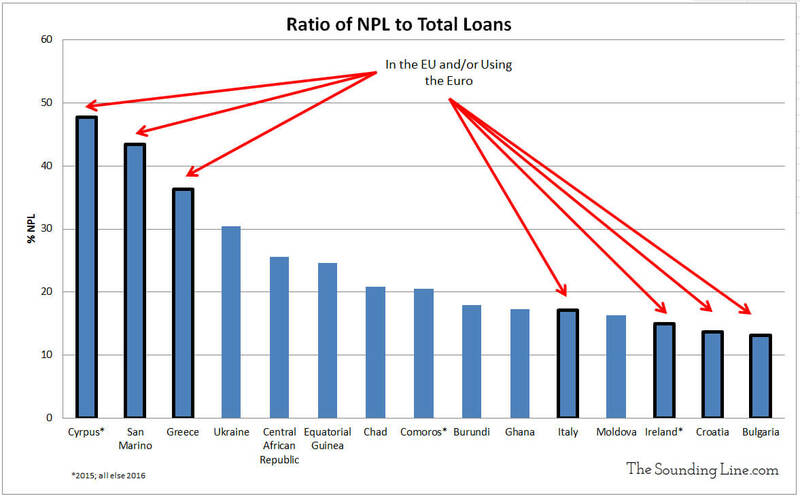 We have seen it in LIBOR most prominently but also elsewhere in the financial sphere. We must also remember that there are 'legitimate' forms of manipulation such as monetary policy which sees both the price and value of our currencies maniplated and indeed debased over the long term. Manipulation is not victimless. To Joe Public a bank receiving a $30 million fine no longer seems newsworthy (it isn't, it didn't appear in the mainstream media) nor does the likely imprisonment of individual traders. It's just 'one of those things' which we pretty much expect to go on. But everyone is a victim. Gold bullion price manipulation, interest rate 'setting' and LIBOR fiddling all mean that markets are rigged. It increases the risks and skews the odds for the average saver or investor who does not have the financial awareness, acumen or power to fight back. Some considering investing in gold and silver, have asked us what is the point of investing in precious metals if there prices are suppressed by bullion banks with the consent or indeed encouragement of monetary authorities? We have been asked this since 2003 when GoldCore was founded. The Gold Anti-Trust Action Committee (GATA) were alleging manipulation back then and indeed even then had a lot of evidence to suggest manipulation had been taking place including central bank and other insider admissions of gold price suppression. Are answer has been consistent. Ultimately the forces of supply and demand for actual physical gold and silver bullion will determine the prices of the monetary metals in the long term. Electronic and paper suppression of prices through futures markets will shake out weak hands, deter some investors and speculators and impact both sentiment in the short and the medium term. However, ultimately the fundamentals of physical supply and demand will lead to higher prices in the long term. This was seen in the 2000 to 2011 gold bull market. Those who are concerned should take a step back and look at the bigger picture. This presents an opportunity rather than a risk. A suppressed price means there is an opportunity for investors to accumulate more bullion at artificially depressed prices. Ironically and counter intuitively, gold price suppression is good news for those prudent few who look at the situation 'holistically', take a long term view and buy gold and silver bullion as insurance rather than purely for capital gains. The key is to ensure you are holding physical bullion, outside of the paper system. Keep it safe by owning segregated and allocated gold and silver, in ultra secure vaults, in the safest jurisdictions. Gold and Silver Manipulation: Can It Be Empirically Verified? - Cyber War Coming In 2018?